Rambo's Rampages...: Dare I say it? But I'll give it to you like this: He's ooking -lay etter-bay oday-tay an-thay esterday-yay. Maybe he won't catch on. 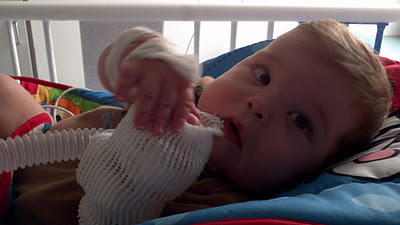 It appears the IV antibiotics and steroids are what he needed. And he is looking ell-way. Don't do it! Don't feel sorry for him. That's what he wants you to do with that sweet sad pitiful look on his face. Resist! Okay, even I can't fight this one. He's so coot! Poor wittle baby in da big ol' mean hospidal. He gets an xray tomorrow - hopefully we'll see ogress-pray. 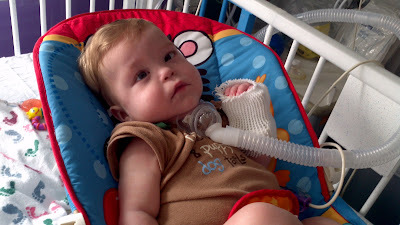 His oxygen when he is sleeping was weaned to 40% and he has done ell-way so far. He seems appier-hay. Best case scenario according to doctors is ome-hay in a ew-fay ays-day. Here's hoping, kid. Don't discriminate. Vote pig latin.